The Mayoress of Ashbourne, Mrs. Sue Bull and her daughter Stacey were among the many people who almost filled St. John’s Church, Ashbourne, last week for the first concert by the Ashbourne Singers. This group have been together for only 10 weeks, yet were confident enough to present an entertaining and tuneful concert of popular and Christmas music, and even invited the audience to add to the seasonal atmosphere by joining them in singing two well known carols. 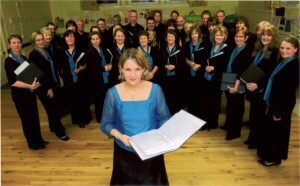 The fact that the group has moved on so speedily since formation is not really surprising for their inspiration and tutor is professional soprano Linda Perry Smith who moved to Ashbourne earlier this year. She explained that soon after arriving she arranged a singing workshop as part of the Ashbourne Festival, attended by eight people. When she found there was nowhere for people to sing she started the group which now has more than 30 members. A vote of thanks to the choir was voice by the Reverend Geraldine Pond who quipped “ we are the first of the fan club”.